Our very own Executive Director Rho Lasden was honored recently in Bowling Green with the Kentucky Colonel award. This award is highest title of honor bestowed by the Commonwealth of Kentucky. 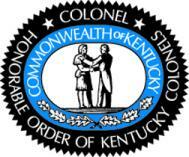 Commissions for Kentucky colonels are given by the Governor and the Secretary of State to honor those with remarkable accomplishments and incredible community service in Kentucky or nationally. Steve Beshear gave the honor by issuance of letters patent. Rho has taken the honor with exceptional grace and humility, however she has requested to be saluted upon enter any room. We are so proud of Rho and what she has given to our back to our state.